Spain’s biggest airport is in Madrid, making it the most likely arrival point for most visitors to the country. Its convenient location in Spain's capital city, with its extensive ​high-speed rail network branching out to cities such as Seville, Barcelona, and Cordoba makes it also a great departure point for exploring the rest of the country. And with a good number of multiday guided tours, you have more options than ever for deciding how much independence or guidance and local knowledge you’d like on your trip. By Plane: Madrid Barajas Airport is Spain's biggest airport. Budget airlines (such as EasyJet and Ryanair) and major carriers alike fly into Madrid from around the globe. With only one international airport in the area, there is no confusion over which airport you will be landing at. Be sure to compare prices on flights to Spain, and check out the Madrid airport transfer. 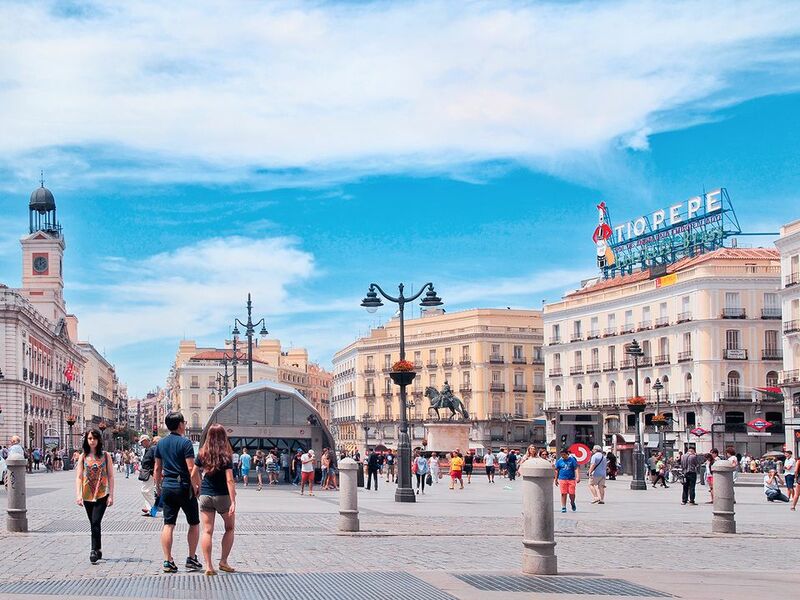 By Train: Madrid is the hub for the AVE, Spain's excellent high-speed train network, which connects the city to Barcelona, Seville, and Malaga, among other cities. It's expensive but very fast (faster than the train). Unfortunately, not all of Spain is on the AVE network. In fact, not all of Spain is covered by train. By Bus: Spain's national bus service is more extensive than Madrid's train network. Buses are cheaper than trains and are usually a lot slower than the train, but not always. For example, Madrid to Granada is only slightly slower by bus but is less than half the price. By Car: Madrid is served by a number of excellent highways. There are no border controls between Spain and France or between Spain and Portugal, so you can drive directly between the countries without stopping. How Many Days Should You Spend in Madrid? People who live in Madrid never get bored, so the number of days you should spend in Madrid really depends on how much time you have and how deeply you want to explore the Spanish capital. However, use this guide as a way to decide how long you need. Start with two days to wander around the city. Explore the historic Madrid de las Austrias, the attractive La Latina area, the bohemian ​Lavapies, and the hipster chic or Malasaña and Chueca. There’s also the Retiro park to explore, lots of great places to eat and drink, and the Prado and Reina Sofia museums, both of which have free entry most evenings of the week. Have a quick look to see the biggest pieces of art (like Picasso's Guernica). Add at least a half day for a proper visit to one of the city’s Triangle of Art museums, or a full day to explore two or three of them. They are all close to one another, so it's easy to spend a solid day experiencing the best of Spanish art. Add a half day each if you’re interested in watching a Real Madrid game, seeing a bullfight, or enjoying a flamenco show. Though all of these take place in the evening, for planning purposes, add a half day for each, though only you know how much activity you can realistically fit in one day. Metro: Madrid's metro service is excellent and should be your preferred way of getting around Madrid. Tickets cost under a euro each when bought as a ten-ticket abono, making it one of the cheapest public transport systems in Europe. You can also buy an unlimited Madrid Travel Pass for use on all of Madrid's public transport. Note that violent crime on the Madrid metro is virtually nonexistent. Pickpocketing, however, is on the rise. Keep your valuables hidden, and hold onto your shoulder bags. Bus: As is the case in many cities, Madrid's bus system is a little harder to get your head around than the metro system. If your hotel tells you a particular destination is quicker by bus than the metro, follow their advice. The tickets are the same as those used on the metro, but in general, you will be using the metro more. Night Buses: From approximately 1 a.m. to 5 a.m., Madrid's night bus service takes over. The buses all depart from Plaza de Cibeles, around the famous Madrid Post Office. Train: Madrid's Cercanias regional train service fills the gap between the metro and the national train service. It may be useful for some routes within the city and for a handful of day trips, but you are more likely to use the metro. Taxi: Taxis are fairly cheap compared to most major cities, but the tight, often one-way, streets of central Madrid mean journey times and prices can easily add up. It can often be quicker to walk. Don't use taxis unless you are traveling a long way across town. Car: Parking is difficult in Madrid, so renting a car is not recommended. If you want to rent a car for travel outside the city, bear in mind it is usually very expensive to drop off the car in a different city from where you started. Public transport is usually easier. Bicycle: Madrid doesn't have the best bike paths, though the situation is improving. Walking Tour or Sightseeing Bus? A good introduction to any city is a walking tour or a sightseeing bus. Madrid's old town area is quite small and compact and much of it is pedestrianized now. The sightseeing bus will take you close to many of the main old town sights as well as to some of the more out-of-the-way places like the Templo de Debod or the Real Madrid stadium. But a walking tour is a much better way to explore central Madrid. You'll be able to access streets that the bus simply can't. Some of the best small cities in Spain are close to Madrid, making them great day trips from the capital. Public transport is good, cheap, and frequent, so you could make any of these trips by yourself. However, it's quicker to go on a tour, so if you wanted to fit something into a half day, or to visit two sites in one day, a guided tour is the way to go. Toledo: The former capital of Spain, Toledo has retained its medieval charm, with its city walls and winding streets. Segovia: The twin charms of Segovia's fairytale castle and Roman aqueduct make Segovia an essential day trip from Madrid. Avila: This is an often overlooked city between Madrid and Salamanca, with some of the best preserved medieval city walls in Europe. El Escorial: El Escorial's monastery and kings' crypt (where the majority of Spain's kings for the past 400 years are buried) are a good alternative to tourist-heavy Segovia and Toledo. Arajuez: A royal residence, easily reached by train from Madrid. El Valle de los Caidos: Controversial burial ground for former dictator, General Franco, complete with magnificent stone cross and basilica, built by Franco's prisoners of war from the Spanish Civil War. Close to El Escorial, so it makes a perfect combined day trip. Seville, Cordoba & Toledo by AVE: Seville and Cordoba are miles from Madrid, but that's what the AVE train was invented for. Take these guided tours of Seville and Cordoba from Madrid and be back in time for bed. Salamanca: The university city of Salamanca is a bit farther from Madrid than the other day trips (two-and-a-half hours away by bus or train) and it warrants at least a night there, but if pressed for time, it is certainly possible for a day trip. How Much Time Should You Add for Day Trips? Add a day if you’d like to visit Toledo. You could even do this as a half-day, with a guided tour. Add another day for visiting Segovia. Again, you can do this as a tour or by yourself. To see both in a day by public transport would be very difficult. Add a half day for visiting El Escorial and the Valle de Los Caidos. These sights are close together but require complicated logistics for connecting the two. Add another day each for visiting any of the following: Seville, Cordoba, Salamanca, or Barcelona. The high-speed AVE rail network makes day trips to Andalusia or Barcelona possible for those short on time, though they warrant much longer. Head south and visit Andalusia. Head east and visit Barcelona and/or Valencia. Head west and visit Segovia, Avila, the Valle de Los Caidos (Valley of the Fallen), and Salamanca and into Portugal. Head northwest and visit Asturias and Galicia. Head north and visit the Basque country and La Rioja. To the south of Madrid, you'll head for Andalusia and visit Cordoba, Seville, Jerez, Cadiz, Ronda, and Granada. Cordoba: Visit as a half-day on the way from Madrid to Seville by high-speed AVE train. Seville: Stay for at least two days. The better connection to Madrid means I would visit here before Granada. Granada: Stay for two days or less, if pressed for time. Ronda: A full day trip (bear in mind the long travel time from almost anywhere). Worth an overnight stay if only to avoid two long journeys in a single day. Jerez: Possible as a half day from Seville, but worth an overnight stay to drink the local sherry in the gorgeous tabanco sherry bars. Cadiz: Visit as a half-day or full-day from Jerez. Choose one: Seville or Granada. If visiting Seville, take the AVE high-speed train and consider a stop in Cordoba to see the Mezquita. There is a Two-Day Seville and Cordoba Tour from Madrid that returns on the AVE high-speed train, the best way to see two cities in just two days. Transport to Granada is a little slower so it's not quite a realistic two-day trip from Madrid, but you'd at least have time to see the Alhambra and taste the famous free tapas with every drink. Choose two: Seville, Granada, Cordoba, Ronda, Cadiz, and Jerez. Seville is well connected to all of these destinations. If visiting Granada or Cordoba, it's not realistic to pair it with Ronda or Jerez. All of the above three-day combinations can be done at a more relaxed pace, or add a third city. Jerez is the best option since it is conveniently located close to Seville. It would be difficult to visit Seville, Cordoba, and Granada in so little time. Pick two or three: Seville, Granada, Cordoba, Ronda, Cadiz, and Jerez. You can definitely see three cities fairly comfortably over five days, possibly: two days in Seville, two days in Granada, and perhaps another city for a day or overnight. If you'd like to see more places, try five days in Seville, Granada, Cordoba, and Ronda. Pick three or more: Seville, Granada, Cordoba, Ronda, Cadiz, and Jerez. You'll have more than enough time to comfortably visit three of these cities in five days. Despite Valencia being Spain’s third-biggest city, you might put Cuenca higher on your to-do list. Unfortunately, it’s on the Madrid-Valencia train line, not the Madrid-Barcelona, making a Madrid-Barcelona-Cuenca trip impossible without going via Valencia. Don't even try driving between the two cities. There are guided tours of Barcelona from Madrid. Consider these Madrid and Barcelona suggested itineraries. Your best bet is to visit Barcelona if you are heading east for two days. Take the AVE high-speed train, if possible. If you are driving from Madrid to Barcelona, stop for lunch in Zaragoza, and see both of the splendid cathedrals there. Barcelona is still your best option, even for three days. If you wanted to meander back to Madrid on your third day, you could stop for a paella lunch in Valencia, the birthplace of the dish, and stop in Cuenca to see the so-called hanging houses. This would involve a lot of driving but it's quite doable and it's even possible by train. You’ll always want to spend the majority of your time in Barcelona, even if you add other cities. How much time to allocate to Cuenca and Valencia depends on your interests. Valencia is a true Mediterranean city, with beaches and paella restaurants and a roaring trade in oranges. It has a more relaxed pace than Barcelona. The old town is actually surprisingly small (its place as the third biggest city is thanks to its sprawling suburbs). It also has a famous Calatrava-designed Ciudad de Artes y Ciencias. Cuenca is a small city in Castilla. Its hanging houses are a sight to behold. Its old town is more attractive than that of Valencia. And its museums, as in Valencia, are also focused on arts and sciences: They are smaller than those of Valencia but cheaper, closer together, and more accessible. Cuenca’s climate is more extreme than that of Valencia. It is a place to explore the narrow old town streets, to see the hanging houses, and to explore the fun museums and art galleries. But you probably won’t want to spend too long sitting with a coffee or a wine on a Terraza. In winter, it will be very cold and in summer it can get extremely hot. Valencia, on another hand, is a city where you can just relax. If you don’t want to visit the Ciudad de Artes y Ciencias, the city center will hold your attention, but not for long. To extend your trip a little, rather than looping clockwise from Barcelona to Valencia and Cuenca, you could loop counterclockwise and visit La Rioja and the Basque Country. Don't try to connect this eastern road trip to the south because the journey between Cordoba and Valencia is not interesting, with less developed roads and no direct trains. You’re better off returning to Madrid first, which is where the train will take you. Most of the cities close to Madrid’s west can be visited as day trips from Madrid. However, it can be fun to connect the dots instead and not return to Madrid each night. You'll reduce travel time, but increase hotel check-in time doing this. Visit Segovia, Avila, and Salamanca, and then head north to Leon (with a quick stop to see the Romanesque churches of Zamora, before returning via the wine region of the Ribera del Duero. Instead of returning from Leon, you could head up to the northwest. Visit Salamanca and then head to Portugal to Coimbra and then to Lisbon. Visiting green, green Spain is a fantastic way to spend a few days outside of Madrid, but there are a few things you have to think about. Fly to Oviedo, A Coruña, or Santiago de Compostela. Take the train to Leon and then explore the northwest loop from there. Take the long route to Leon via our recommended western cities and then continue to the northwest from there. The real allure of the northwest of Spain is the countryside. West from Santiago de Compostela, you have the Rias Baixas "sunken valleys" along the fearsome Galician coast that offer fantastic views of the turbulent Atlantic. To the east of Oviedo, you have the Picos de Europa mountains. On the other hand, the cities have their charms, too, particularly Santiago de Compostela, where the old town is a UNESCO World Heritage site. Oviedo has its Bulevar de Sidra (Cider Boulevard) and even A Coruña has the Torre de Hercules (Tower of Hercules), well worth a visit if your flight arrival time means you can’t get over to Santiago for a full day there. Of course, cities have a more varied nightlife, vegetarian options, and other city trappings. Considering the need to check in to two flights, two days should not be enough time. Bear in mind that this actually means one day and two periods of checking into flights. Fly to Oviedo and explore Oviedo. In each case, fly back. Fly to Santiago, A Coruña or Oviedo visiting Santiago de Compostela or Oviedo. Lunch in Leon and two days in Santiago or Oviedo. Drive or take the train there and fly back to Madrid (or vice versa). Heading directly north from Madrid, you’ll pass Burgos, with one of the most impressive cathedrals in Spain, which is a great place to stop for lunch. Turn slightly east and you’ll soon enter La Rioja, Spain’s most famous wine region. Then head up to the coast and you’ll reach the Basque country, home to the Guggenheim museum and San Sebastian, the gastronomical capital of Spain. Here are a couple of things to bear in mind when planning a trip to this area of Spain, particularly to the wine regions. Will You Visit La Rioja? Spain is a nation of wine regions, with excellent, well-priced wines throughout the country. The Basque country’s proximity to La Rioja means it has even more good wine than the rest of Spain. Therefore, if your interest is just drinking the wine, there’s no need to visit La Rioja. That said, the grape-growing areas of La Rioja are stunning and worth a visit for their beauty alone. For those with an interest in wine production, the wine tours can be very enlightening. So there is more to visiting La Rioja than just drinking wine. Do You Have a Designated Driver? Spanish vineyards don’t tend to be well connected by public transport. But driving is not really an option if everyone in your party wants to sample the wines. And even if you do have a driver, just turning up at a vineyard will probably mean you’ll be greeted by a "closed" sign or you may not find anyone who speaks English. Thus, it is essential to book your vineyard visits through winetourismspain.com. For anyone without a driver, a guided tour will allow you to indulge in the wine. If you don’t have a designated driver and you don’t want to do a tour, visit Logroño. Its Calle Laurel is the best street for trying a variety of wines, with a great tapas at each stop. These are the twin stars of Basque country. But where should you base yourself? It is unquestionably San Sebastian. While the residents of Bilbao try to argue their pintxos (Basque tapas) are the equal of those in San Sebastian, they simply are not. And with San Sebastian’s Michelin-starred restaurants (and the cider houses), San Sebastian wins hands down for gastronomy. But what if you favor art over food? If you favor art over food, Bilbao is your best bet, with the Guggenheim as one of the premier art museums in Spain. In fact, the tapas of San Sebastian and the Guggenheim of Bilbao can be both easily be visited as a day trip from the other city. Keep in mind that Bilbao also has an international airport, which may make travel easier for you. How Many Days to Spend in Basque Country? With half a day needed to visit the Guggenheim, and a day needed to experience the gastronomy of San Sebastian, you'll need a minimum of two days. If this is all the time you have, you’ll need to fly to Bilbao, head to the Guggenheim and then over to San Sebastian for the night. Have a day in San Sebastian and then go directly to the airport for your return flight. You could also stay in Bilbao with a day trip in San Sebastian, but the travel logistics may be time-consuming. With three days, you have the time to drive up through Burgos. You could even take a detour via the wine region of Ribera del Duero. Once you’re in Basque country, you have two days to sample San Sebastian gastronomy and the Guggenheim in Bilbao. If you are only visiting for three days, you’ll need to cross one of these off your list in order to fit in a day trip to La Rioja. You could add a day trip to a fishing village close to San Sebastian and sample even more tapas bars in San Sebastian. Madrid tends to be cold and dry in winter. Snow is possible but rare. Temperatures in the towns and villages outside Madrid tend to get even colder. There is usually plenty of sunshine, so your photos will still look great. Spain is an hour ahead of the UK, which means you get longer evenings than you might expect. December in Madrid is dominated by Christmas and New Year's Eve. Both are traditionally family affairs, but you'll find some bars and restaurants open on Christmas Day. If you're in Madrid for New Year's Eve, head to Puerta del Sol to be with thousands of other visitors to the city eating 12 grapes, one for each stroke at midnight. But don't expect many Madrileños to join you because they'll be with their families. You won't even find many bars open for the big moment. But have no fear. At around 12:30 a.m., the bars open and the youth of Spain say "¡Adios, Mama y Papa!" and head out to join their friends. Madrid is emerging from its Christmas gluttony with, well, more gluttony, as the city's Gastrofestival shatters everyone's attempts at detox in January. What? Kids get gifts from the three kings on the night before the January 6. On the January 5, there is a procession through the streets in which the kings throw candy to the crowds. Where? Valladolid. Here's how to get from Madrid to Valladolid. What? Amateur motorbike rally, just outside the city of Valladolid. Where? La Alberca, near Salamanca. Here's how to get from Madrid to Salamanca. What? Special meal deals in restaurants, exhibitions on gastronomy in culture, and more. What? Local festivities where everyone dresses up as devils. What? Lovers go out for dinner and buy chocolates. There's an expression in Spanish: "Hasta el 40 de mayo no te quites el sayo" ("Until the 40th of May [June 9], don't take off your raincoat. "), which means rain is always possible until June. Where? Madrid. Other cities will have their first bullfight of the season around this date. What? The beginning of the year's bullfights. Fights are every Sunday until October, with extra events throughout the year. or see the full bullfighting schedule for Madrid for this year. What? It's Carnival time! Spain's two main gay communities, Chueca in Madrid and Sitges near Barcelona, are the stars of the shows here. Cadiz and Tenerife also host famous processions. Where? Valencia. Though Valencia is 200 miles from Madrid, the AVE train will get you from Madrid to Valencia in just over an hour and a half. What? The biggest party in Spain. The third biggest city in the country shuts down for a week to hold one of the biggest street parties you'll ever see. Xàtiva, Benidorm, and Denia also have mini-Fallas festivities. Valencian communities make paper-mache sculptures, sometimes in the shape of traditional figures, sometimes in the shape of famous people like Shrek or Barack Obama. The creations are on display all over the city before being burned in one of the many bonfires. This takes place amid much partying. You haven't seen bonfires until you've seen the ones the Valencians light on the last night of Las Fallas. Here's what to do at Las Fallas. What? Half-marathon and 5-km run in the capital. What? See one of the regular Sunday bullfights, or plan your visit with a look at the full bullfighting schedule for Madrid. Dates for the following events are not confirmed. Click on the links for more details. What? Daily bullfights from about May 9 to June 9, with the main festival from about May 11 to May 15. Summers in Madrid can get very hot. In August, much of the city shut down, with many bars and cafes closed as the locals go to the beach. It tends to be very dry, which makes for slightly cooler nights and mornings. Definitely look for accommodations with air-conditioning if you are staying in Madrid in the summer. Where? Cordoba. The high-speed train from Madrid to Cordoba will get you to the city in under two hours. Event Veranos de la Villa (Summer in the City). Where? Stages take place largely in the north of Spain (Galicia, Navarra, Basque country, and Catalonia) and around Madrid. What? Spain's version of the Tour de France cycling event. Dates vary year to year but tend to straddle August and September, finishing in Madrid in mid-September. What? Book tickets for bullfights in Madrid or see the full bullfighting schedule for Madrid. What? Central Madrid will have its Christmas lights turned on. Expect crowds on Gran Via, Paseo de la Castellana, and Paseo del Prado. Christmas in Madrid can be very special. Which Is Better to Visit: Madrid or Barcelona?